dressed up everyone's favorite Totchos like a gourmet burger, complete with blue cheese crumbles, onions and creamy blue cheese dressing. 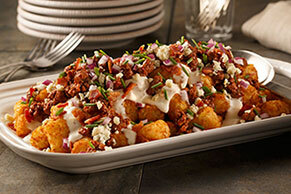 Spread TATER TOTS onto platter; drizzle with dressing. Top with ground beef mixture, bacon and remaining ingredients.